Every email you send out of your agency to a prospect or client could be a marketing opportunity — if you only take advantage of it. While email newsletters are a great way to engage with your clients, I suspect you also send hundreds, if not thousands, of emails out every month that you could use as a gentle reminder of other products and services you have available. Email signatures are nothing new. Outlook has the built-in capability of creating standard email signatures and allowing individuals to choose which one they want to use on a particular email. The problem? There is no way to centrally manage the messages that are included in the email signature. That is where a new service called Sigstr comes in. This platform offers the ability to centrally manage every email signature and update individual user signatures instantly. Different marketing campaigns can be built by uploading an image or by entering text into the platform. Employees do not need to edit any information, which makes it easy to have a consistent message going out. The signature blocks included in the emails are mobile responsive so they look as good on a mobile device as they do on a desktop. Employees manage their specific contact information. The organization administers the marketing campaign content. The platform also allows you to create signature campaigns for different groups. This enables you to build different signature campaigns for your personal lines, small commercial, and larger commercial departments. The platform works with most email systems including Outlook and Gmail. Referrals: Referrals are always important. Who knows how many new referrals you could obtain using a gentle reminder at the bottom of an email? Newsletters and Social Media: Include a banner that invites people to sign up for your newsletter or follow you on various social platforms. Upsell/Cross-Sell: Are you sure every client knows the full scope of the products and services you offer? You could create a marketing calendar that highlights a different type of product every month in the emails that are going out to your current clients. A free version of the platform is available for individual use. Business versions start at $3 per user per month. 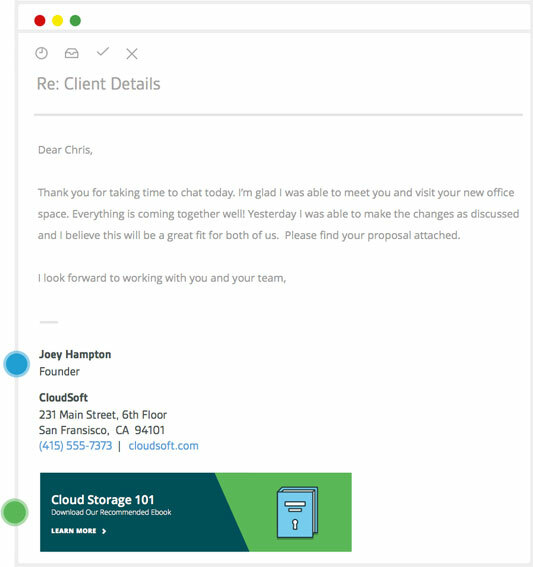 Sigstr has taken an overlooked marketing asset — client emails — and created a simple way for organizations to make use of this marketing and branding opportunity. How do you use email signatures to market your products and services? Let me know.